Preheat oven to 350°. Lightly grease a 7 x 11 cake pan and set aside. In a large mixing bowl, add the dry cake mix, spices, buttermilk, molasses, eggs and oil. Mix until well combined. Pour into greased cake pan and bake for 30-32 minutes or until an inserted toothpick comes out clean. Allow cake to completely cool. Using a straw or wooden spoon handle, poke holes into the cooled cake. Pour the sweetened condensed milk all over the top of the cake and into the holes. Cover and chill overnight or for at least 4 hours to allow the milk to saturate the cake. Cover the entire top of the cake with Cool Whip, using a spatula to smooth the topping out evenly. Sprinkle with crushed gingerbread cookies. Return to refrigerator and chill for an additional 2 hours. 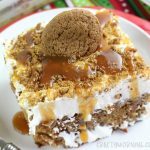 Before serving, drizzle caramel topping on each slice of cake and top with a whole gingersnap cookie.